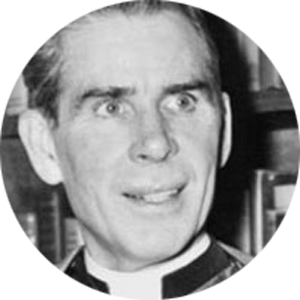 Archbishop Fulton J. Sheen is arguably the most beloved Catholic televangelist and radio personality of modern times. At the age of twenty-four, Sheen was ordained a priest and began to capture the hearts and minds of people through his preaching and teaching of the Gospel in a way that was relevant and easy to understand. In 1930 Sheen began and hosted a weekly Sunday night radio broadcast called The Catholic Hour, drawing an audience of four million people each week for two decades until he was appointed auxiliary bishop of the Archdiocese of New York in 1951. Sheen also hosted a Catholic television program—Life is Worth Living—for which he won an Emmy Award in 1952 for “Most Outstanding Television Personality.” The show ran until 1957, luring as many as thirty million weekly viewers. In addition to his work as a televangelist, Sheen was also the author of many renowned books, including Way to Inner Peace, Life is Worth Living, and The Priest Is Not His Own. In 2002, Bishop Daniel Jenky, CSC, of the Diocese of Peoria, Illinois, officially opened the cause for Sheen’s beatification and canonization.